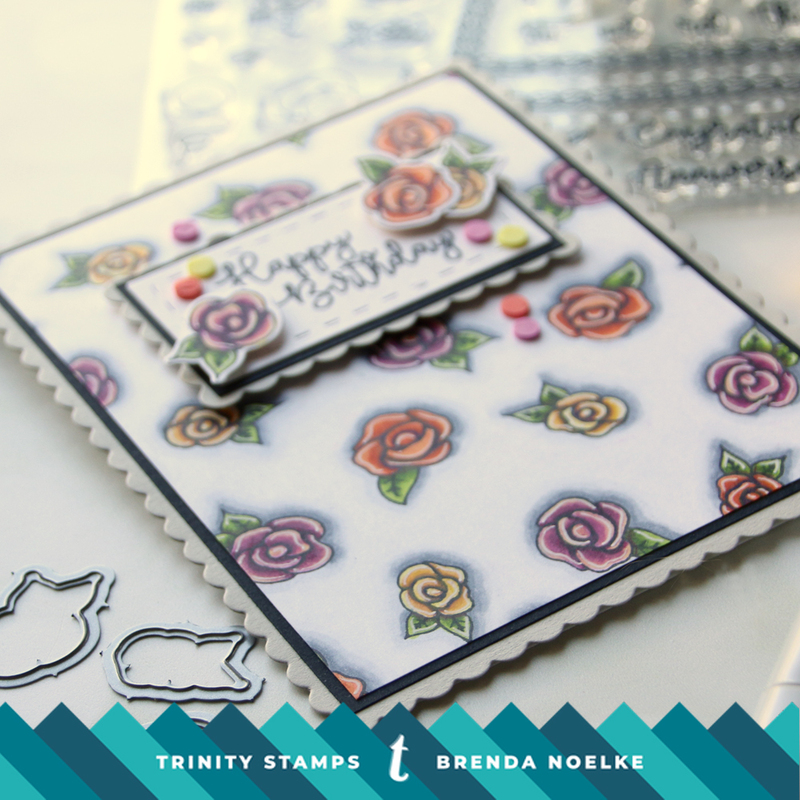 Happy Thursday, Trinity Stamps friends!! It’s Brenda, here with you on this Thursday morning!! I love to take the small images from my stamp sets and use them to make my own patterned paper. 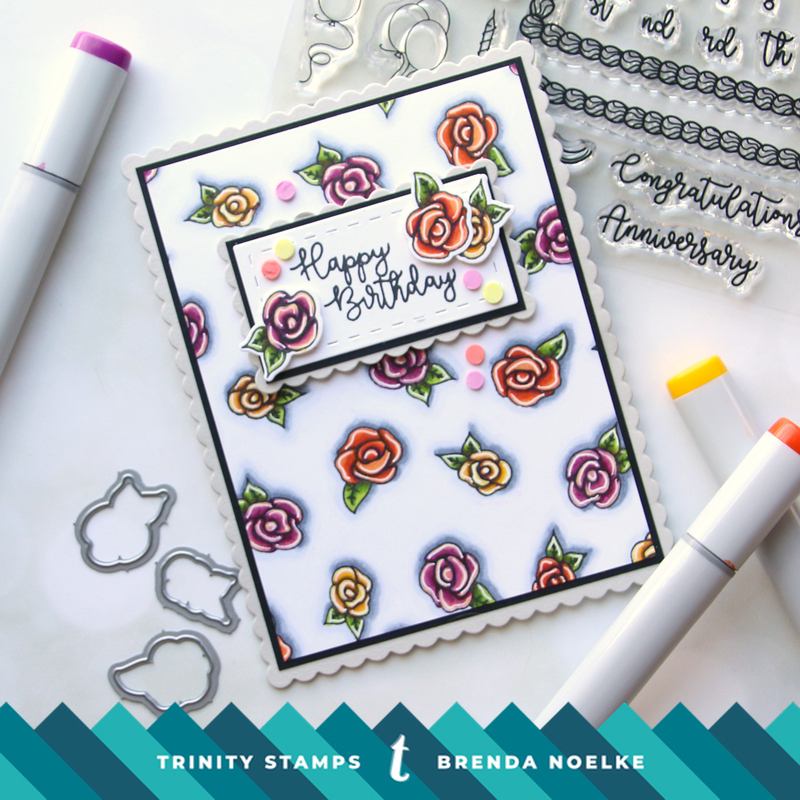 The roses in the Create-A-Cake stamp set are perfect for this technique!! Plus, if you know me, you know that I’m all about the flowers…lol. Give me ALL THE FLOWERS!! 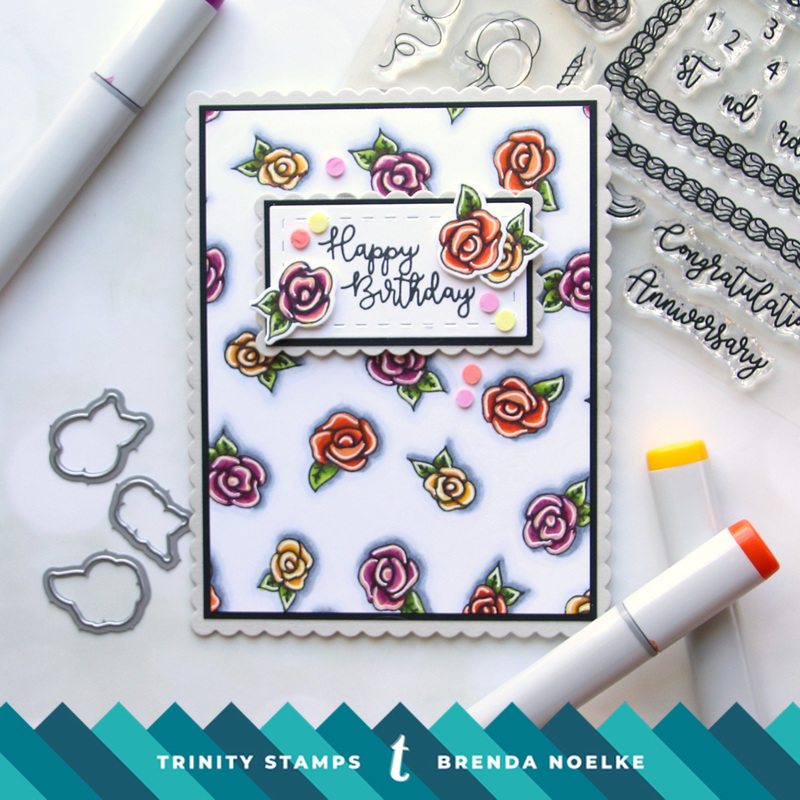 To begin, I stamped the three roses from the Create-A-Cake stamp set randomly onto a panel of white cardstock with Momento Tuxedo Black Ink. I colored them with Copic markers and added additional dimension with colored pencils. A white gel pen added some highlights along the top petal of each flower. The Copic-colored panel was adhered to a black cardstock panel that was cut slightly larger, then onto a pale gray cardstock panel that was die-cut with a scalloped edge die. The sentiment, also from Create-A-Cake, was stamped onto a die-cut white panel using Momento Tuxedo Black Ink. It was also mounted to black cardstock and a gray scalloped rectangle, before adhering it to the background panel with foam adhesive. Three of the roses were cut using the coordinating Create-A-Cake Dies and popped up with dimensional adhesive onto the sentiment panel. Finally, a sprinkling of Candy Confetti Sprinkle Embellishment Mix finished off the card. I hope I have encouraged you to look at the small images in your stamp sets and use them to make your own pattered paper!! Delightful use of those flowers! Love the patterned paper you created! This came out great!